This beautifully furnished villa has an elegant granite floor entrance hall leading through double light oak half glazed doors into a spacious and tastefully furnished lounge, where there are some of the many beautiful pictures that are a special feature of this delightful villa. There is an attractive polished stone fireplace and log burning stove. Patio doors give views of pool and access to terrace and garden. The large well equipped open plan dining room and kitchen has granite worktops, ceramic hob, oven, microwave, dishwasher, fridge-freezer and washing machine. Downstairs there are two twin bedrooms each with own en- suite facilities. Patio doors lead onto garden terrace. From the entrance hall a wide stone staircase leads to the first floor which has the master bedroom, with large double bed, en-suite bathroom and twin bedroom with en-suite. Both rooms have patio doors leading onto a very large sun terrace with beautiful panoramic sea and countryside views. Villa and Owners: The villa is used mainly as the owners winter home and is equipped to a much higher standard than is normally found in a rental villa. Comments in the visitors book on your stay will be most welcome. We provide: All bed linen, changed weekly, bathroom and pool towels, twice weekly. An electronic safe is provided for your valuables. Cars can be booked at the same time as the villa, prices on request. We have used a local family firm for ten years. They are friendly, helpful and give excellent service. Leisure activities and things to do: Praia dos Caneiros is the nearest beach to the villa. Praia Grande on the outskirts of the beautiful fishing village of Ferragudo is only five minutes drive away (other small beaches well worth a visit are passed on the way) here there are facilities for wind surfing, jet skiing, beach volley ball, a small childrens play area and beach restaurants. many restaurants, bars and shops. The Moorish castle in Silves is well worth a visit. The slide and splash waterpark great for children and adults alike is only a ten minute drive away. A day at the Zoo Marine to see the performing dolphins is an enjoyable experience and only takes 15 minutes by car. We are a professional couple who have had a holiday retreat in the Algarve for 29 years which we have successfully rented out to many happy guest’s’ . Our present Villa was built for us in 2001. We were fortunate enough to have a considerable input into the design of the building meeting our and guest’s needs. Every bathroom has its own ensuite which has under floor heating. There is large LCD flat screen television in the lounge. Outside a covered area gives shade when eating on the terrace.. For ease of access to and from the villa there are remote controlled gates and a car port to keep your car cool. We have just returned from a two week stay. Villa is as described and as shown in the photos - very clean and spacious with high quality fixtures and fittings. The pool, surrounding terraces and BBQ area are lovely. Villa is cleaned and towels replaced twice a week. There is a mini mart and a few cafes/restaurants in walking distance with Carvoeiro, Ferragudo, Portimao and Alvor all short drives/cab rides away for restaurants, shops, boat trips, the water park and beach clubs. Ron was helpful and responsive and we would recommend the villa. Great Property, Great Location, Perfect for Families! We have just returned from a great stay at this villa. It is much bigger than looks in pictures, had all the amenities and is in great condition! Perfect location for exploring the Algarve and would definitely return! Was a pleasure dealing with Ron who was also super helpful! Top notch facility in a location convenient for golfers and sun worshippers. Our group of four couples has made an annual pilgrimage to Portugal in May for a significant number of years....and this tops the hit list. The villa has excellent facilities, including a large pool, and is well located for everyday shopping needs, local beaches, an excellent choice of restaurants and a variety of golf courses... all of which we used to the full. The villa is decorated to a very high standard, is roomy, light and well equipped. The garden, terrace and pool areas are perfect. Good location near to beaches, shops and restaurants. 9 of us stayed here for the first 2 weeks in August 2017. There was 6 adults 2 children 9 and 7 and a 7 month old. All initial communication was done via Ron and he answered all the questions we had and made everything so easy. We hired a car from carvoiero car hire online and they dropped it off to the villa and collected it 2 weeks later. The property itself is beautiful, upstairs there is a double bed room and we had the travel cot supplied by the villa in there. We took our own foldable quad size mattress for the cot and I suggest you do the same if you want to use it other wise it is just 2 blankets with a sheet over. The other room upstairs is 2 twins. All the room upstairs and downstairs have enusites and are well stocked with towels. The cleaners come in twice a week to change beds and towels and toilet rolls plus give the floors a mop etc... Downstairs there are 2 more twin bedrooms but we arranged for the beds in one room to be pushed together to make a double. All the bedrooms and the living rooms have air con which was needed as nearly every day was 36 degrees. The living room has comfy sofas and good size tv which has English terrestrial channels on it. There is an alfresco dining dining section that is under cover as you step out from the kitchen and this also has a BBQ area in it. The outside is well maintained and the gardeners showed up which a lawnmower and hedge trimmer to ensure the gardens were well maintained. The pool was also checked by the pool guys and topped up accordingly. There is a reception over the road and if there was any issues we went over there and it was pretty much sorted straight away. The area is great and I can recommend the local restaurant Luisa Place. They do also do takeaway from the whole menu that you can arrange to collect. The town is about a 10 minute or an approximate 6 euro uber ride away. It was too far to walk for us and is all down Hill on the at the way there but all up hill on the way back. The town Carvoiero is nice and the ice cream shops and restaurants are great. I recommend the Ferrero Roche ice cream from the ice cream shop on the corner at the end. Ultimately we want to come again. The villa is perfect, the town is great and it's bang in the middle of the algrave for travelling to other towns. Give this 5 star easily. We went as a family - 4 adults and 2 children and could not have been happier with the set up of the villa. Ideally situated, for us, in a quiet urbanisation within easy driving distance of amenities and supermarkets. The villa has recently had some new furniture and can honestly say the sofa's were as comfortable as we would want in our own home!! All 4 bedrooms have en-suites so that was brilliant in the morning and evening when we were getting ready to go out. The pool is a good size, with inflatables available, and our 2 grandchildren used it at every possible opportunity, we adults also but not quite so frequently. The maid came in a couple of times a week to clean and changed towels and bedding which was really appreciated. The villa is set up so you can easily cater for yourselves if you so desire. The covered terrace is excellent for alfresco dining, we used it every morning for breakfast and several evenings for a BBQ. The reception for Presa de Moura, which is just across the road from the villa is useful to order fresh bread for the following morning and also tickets for many of the attractions on the Algarve. We are pleased Geoff and his family had a wonderful holiday in the villa and found everything to their liking. They are interested in coming back in the future and we will be delighted to have them. Villa Libron is situated on the small presigious Presa de Moura development between the fishing village of Carvoeiro(3k) and Ferragudo(3k),just 40 minutes from Faro Airport. It has views overlooking the ocean, Monchique Mountains and surrounding countryside. Beaches, shops and restaurants are within a 5-10 minute drive. The nearest mini market is 500 metres. 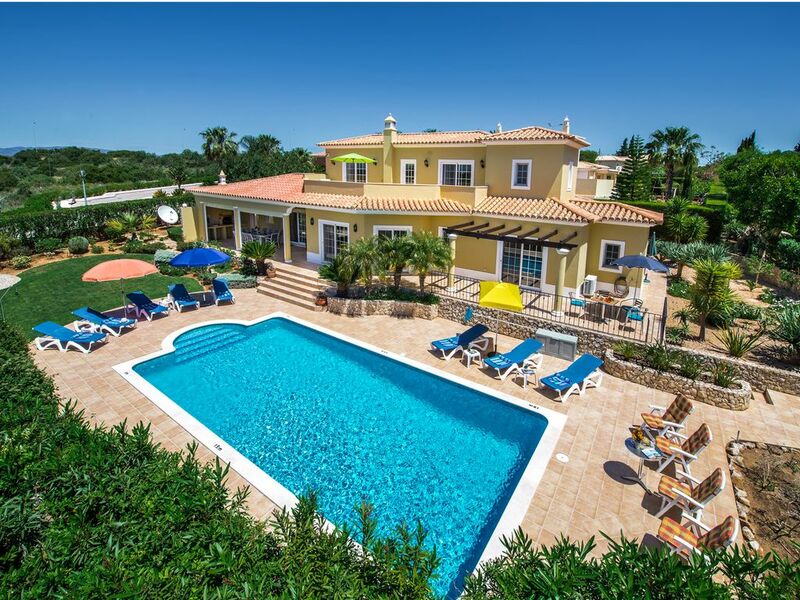 The towns of Alvor, Lagoa, Portimao, Silves and Calder Monchique are within easy reach of the Villa. Golf: For golf enthusiasts the two 18 hole golf courses of Pinta and Gramancho with the David Leadbetter golf school are less than a five minute drive away. We can arrange discount fees for clients. On this beautiful complex there is the added attraction of an eight rink bowling green.